Nitric oxide (NO) is a highly reactive molecule that rapidly diffuses and permeates cell membranes. In animals, NO is implicated in a number of diverse physiological processes such as neurotransmission, vascular smooth muscle relaxation, and platelet inhibition. It may have beneficial effects, for example as a messenger in immune responses, but it is also potentially toxic when the antioxidant system is weak and an excess of reactive oxygen species (ROS) accumulates. During the last few years NO as been detected also in several plant species, and the increasing number of reports on its function in plants have implicated NO as an important effector of growth, development, and defence . The innate immune system of organisms as diverse as vertebrates, invertebrates, and plants shows several characteristics similar with respect to involvement of NO. In the mammalian immune system, NO cooperates with ROS to induce apoptosis of tumor cells and macrophage killing of bacteria. In plants a similar mechanism have evolved to prevent tissue invasion by pathogens. Attempted infection by an avirulent pathogen elicits a battery of defences often accompanied by collapse of challenged host cells thus delimiting the infected zone and avoiding the multiplication and spread of the pathogen. 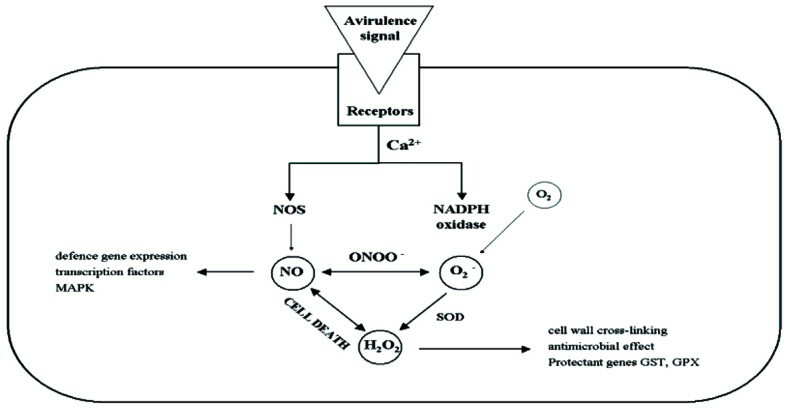 The rapid accumulation of ROS and NO through the activation of enzyme systems similar to neutrophil NADPH oxidase and nitric oxide synthase is one of the earliest events in this hypersensitive reaction (HR). Several lines of evidence suggest that death of host cells during the HR results from the activation of a cell death program, encoded by the plant genome and activated by a fine modulation of O2 -, H2O2 and NO levels . Both NO and ROS are necessary to trigger host cell death (see Figure 1); they are also components of a highly amplified and integrated defence system that involves activation of ion fluxes, changes in protein phosphorylation patterns, extracellular pH, membrane potential, oxidative cross-linking of plant cell wall proteins, and perturbations in the level of cytosolic Ca2+ that triggers the local expression of resistance genes . NO also functions independently of ROS in the induction of various defence genes including pathogenesis-related proteins and enzymes of phenylpropanoid metabolism involved in the production of lignin, antibiotics and the secondary signal salicylic acid (see Figure 2). The mobile nature of NO and its chemical reactivity with various cellular targets means that downstream effects of NO may be directly induced by interaction with various cellular components, like ion channels or proteins that modulates gene expression, or indirectly following interaction with signalling proteins such as protein kinases. NO signalling functions depend on its reactivity and ROS are key modulators of NO in triggering cell death, although through mechanisms different from those commonly observed in animals . In summary, although several hypotheses still await experimental demonstration, it is now clear that NO is an important component of plant defence systems. Much evidence supports the view that NO plays a key role in disease resistance responses. Moreover, the recent identification of a plant NOS will lead to the characterization and manipulation of mechanisms modulating NO signalling. Thus, the understanding of NO signalling functions at the biochemical, cellular and molecular levels will soon make it possible to discern several important physiological and pathological processes in plants, as has already been demonstrated in mammals.